If you’re using Windows 8, it’s time to upgrade to Windows 8.1, for free, a day ahead of promised General Availability of Windows 8.1 by Microsoft. Microsoft is providing Windows 8 users the free upgrade to Windows 8.1 in order to address some of the major gripes that the early adopters have over the new operating system, while making the OS even better by bringing to table several new apps and features. Windows 8.1 contains several major changes and features which many Windows 8 users have yearned for, such as ability to boot directly to desktop; Start button; no classic Start menu yet but now touch-enabled tile-based Start screen has quicker access to All Apps by swiping up and more configuration to mimic classic Start menu; improvement to onscreen keyboard, hands-free gesture using camera (think Kinect) for supported apps, automatic background update of apps, lock screen access such as answer Skype calls and take photos with camera for supported apps, better multitasking of Modern (Metro) apps, global search, ability to open more than 10 web pages and side-by-side in touch-based IE, improvement to default apps such as Mail, addition of new apps and etc. Blogging Windows has mode details on the new features and enhancements of Windows 8.1. Unlike previous updates, hotfixes or service packs for Windows operating system, Windows 8.1 is not offered through Windows Update. 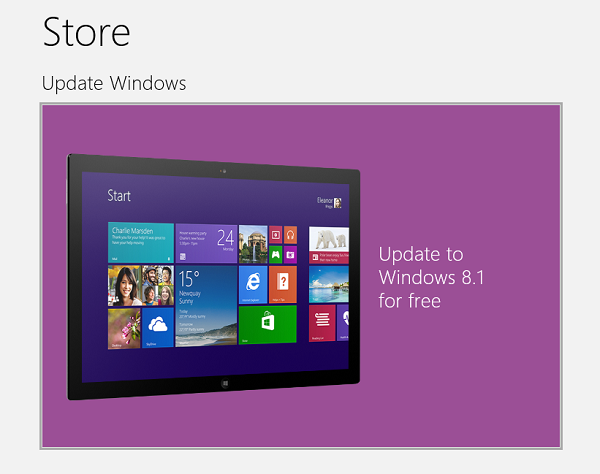 To initiate the upgrade to Windows 8.1, visit Windows Store, and you should be presented with the option to update to Windows 8.1 for free. If you have previously upgraded to Windows 8.1 Preview from Windows 8 with genuine license, you can grab Windows 8.1 for free from Windows Store too, without the need to reinstall Windows operating system. Have no Windows 8 or Windows 8.1 license yet? Windows 8.1 is available for $119.99 while Windows 8.1 Pro can be had for $199.99 from your local retail store or online store such as Amazon.com. The final version of Windows 8.1 RTM rolled out include many more updates that fixes bugs that discovered since the OS is RTMed months ago. If you download and install the leaked Windows 8.1, do check for hotfixes pushed through Windows Update to improve the system stability. Remember to back up your data before starting the update, just in case something goes wrong. Best still, create a system image which allows you to easily recover the system by restoring the image. It’s also important to check if there is updated Windows 8.1 drivers for your PC’s components.